Sathya Sai Baba publicly declared his mission in 1940, at the age of 14. Since then, he has daily exhibited in practical and concrete terms the highest ideals of truth, right conduct, peace, love, and nonviolence. He has often stated, “My life is my message.” Each day, hundreds of pilgrims make their way to the tiny hamlet in southern India where Sathya Sai Baba’s ashram (spiritual headquarters) is located. They come not only from India but from virtually every country of the world. Over the years, followers have organized to foster the construction of a variety of buildings and facilities to house and otherwise accommodate the ever-increasing number of visitors. The name of Sathya Sai Baba’s ashram is Prasanthi Nilayam, which means “abode of the highest peace”. In addition to emphasizing the pursuit of academic excellence, Sathya Sai Baba’s system of “integral education” is designed to foster self-discipline and pro-social conduct. Students are required to take courses on morality and spirituality and to devote several hours each week to some form of community service. Sathya Sai Baba says that “the end of education is character”. Recently, Sathya Sai Baba initiated a project to provide an adequate supply of pure water to 1.5 million inhabitants of the State of Andhra Pradesh (India) who were living in drought conditions. The Prime Minister of India traveled to Prasanthi Nilayam (Sathya Sai Baba’s main ashram) in order to inaugurate the project. Sathya Sai Baba demonstrates that it is the duty of society to ensure that all people have access to the basic requirements for the sustenance of human life. 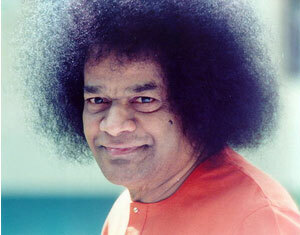 Sathya Sai Baba has come to this world to offer moral and spiritual sustenance and to lead us from darkness to light. He encourages us to recognise who we are. We are not the mind; we are not the body; we are the eternal spirit. We can understand and become who we truly are by turning inwards with faith in God and an intense yearning to know Him. Our conscience is a reflection of the eternal spirit. Sathya Sai Baba tells us that our conscience is our master. When we follow our conscience, our thoughts, words, and deeds will be noble and consistent. Spirituality is having the courage and determination to follow our conscience in all things and at all times. In doing so, we recognise that we are all united in God. We are bound together by divine love. Sathya Sai Baba says that He has come for all mankind and not for any particular community, religion, country, or interest. His teachings are universal and not sectarian, attracting devotees and seekers of all religions, spirtual paths and nationalities. Sathya Sai Baba’s capacity of control and endurance cannot be easily understood. His biggest miracle is His ability to transform individuals into loving, caring and sharing human beings. Sathya Sai Baba has proclaimed, “My Life is My Message” and He invites people, “to come, inquire, examine and then decide” for themselves if they want to follow His teachings. Sathya Sai Baba says that we are all embodiments of God —we are God— and that the chief goal of our lives as humans is to realize that we are God, to experience that we are Divinity, to achieve “enlightenment”. Sathya Sai Baba said in 1953 that, “there is no escaping it; all creatures have to reach God some day or other, by the long route or by the short route.” And he mentioned this topic of realizing who we really are in almost every one of his 1500-odd published discourses. Believe in God –for there is only ONE GOD for all mankind, though He may be called by many names. Respect all other religions –for no religion advocates the negative and lower qualities of man.